1. Preheat the oven to 180˚C, gas mark 4. Score the fat on each duck breast in a criss-cross pattern; season. Heat a frying pan and dry-fry the duck breasts, skin-side down, over a low-medium heat for about 8 minutes, until the fat is crisp. Turn and cook for another 2 minutes, then transfer to a baking tray, skin-side up, and roast for 10 minutes. 2. Meanwhile, put the noodles in a heatproof bowl, cover with just-boiled water and set aside for 10 minutes. Combine all the dressing ingredients in a bowl. Rest the duck breasts for 5 minutes, then slice. Drain the noodles, refresh under cold running water and drain again. 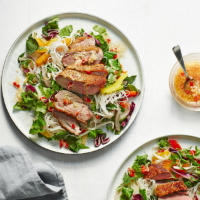 Toss with the vegetables, herbs and dressing, divide between plates and top with the sliced duck. This recipe was first published in Thu Jun 01 16:51:44 BST 2017.